The object of the game is to guide Frogger home in 60 beats of the clock or less, without getting hit by cars, drowned or eaten alive by slimy creatures that slither through the river. 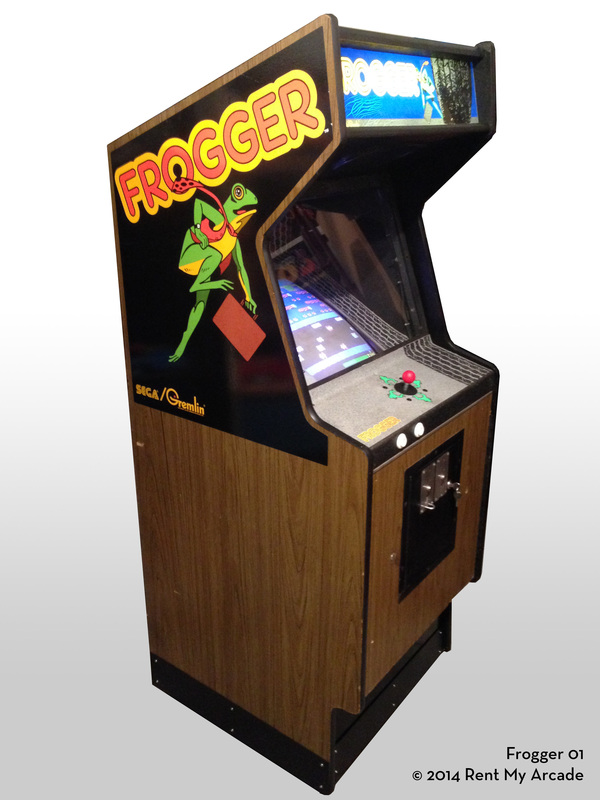 Frogger must dart between cars and trucks on a five lane highway, ride on diving turtles and hop on rolling logs to get home. In advanced rounds, Frogger encounters deadly snakes, otters and crocodiles. Ten points are scored for each safe hop. Landing home earns 50 points and if Frogger makes it home with time to spare, 10 points are added for each beat saved. Frogger earns bonus points by rescuing a lady frog from a log and giving her a lift home. Two hundred bonus points are scored when Frogger catches and eats flying insects and also if he lands at home where a fly is buzzing. Filling every home with happy frogs awards 1,000 bonus points for a job well done! H: 68", W: 25", D: 27"